Cryogenic (periglacial) processes are a collective term used to describe a number of distinct processes which result mainly from alternate freezing, cooling, and thawing in soils, rocks, and other materials (Kudryavtsev et al., 1978a; Permafrost Science, 1981; French, 1996). These processes form cryogenic relief within the periglacial domain and include frost heaving and ice segregation, freezing of injected water, development of thermal contraction cracks, and formation of ice (or soil) wedges, thawing of permafrost (thermokarst), solifluction and frost and cryogenic weathering of soil, ground, and bedrock. These processes occur across the cryolithozone. However, there are certain spatial regularities in their distribution. Frost or thermal contraction cracking creates the most typical cryogenic landforms: ice wedge polygon relief, also known as tundra polygons or fissure polygons. Sand or soil wedges are another type of frost fissure which develop when cracks are filled with mineral soil or sand (Pewe, 1959; Kudryavtsev et al., 1978a; French, 1996). However, sand- or soil-wedge polygonal relief is not characteristic of Russia. According to Popov (19626) and Dostovalov and Popov (1966), the size of the polygonal net reflects severity of winter climate, since low winter temperatures encourage thermal cracking. This process is also regulated by snow depth due to the insulating effect of snow cover. The Taymyr peninsula and Eastern Siberia are the major regions of ice-wedge polygon occurrence. Various landscapes (plains, lowlands, wetlands, river floodplains, river and marine terraces, watersheds, gently inclined slopes) are characterized by different patterns of polygonal relief. In Western Siberia and in north-eastern European Russia ice-wedge polygonal relief is observed only in the continuous permafrost zone within wetlands in river valleys, watersheds, and peatlands (so-called flat-topped polygonal peatlands). In Eastern Siberia, it extends up to the massive-island permafrost zone where it occurs in river valleys and wetlands. Size, form, and age of polygons vary in response to such factors as air and soil winter temperature, soil composition, ice content, specifics of sedimentation, ground drainage, and vegetation (Dostovalov and Popov, 1966; Popov, 1967; Kudryavtsev et al., 1978a; French, 1996). Typical dimensions of ice-wedge polygons range between 5-20 m in peaty soils and 10-50 m in mineral soils. On low marine terraces, composed of saline deposits, polygon dimensions can reach 100 m (Geocryology of the USSR: Eastern Siberia and the Far East, 1989). The main stages of ice-wedge polygonal relief evolution are growth, conservation, and degradation. The ground polygonal nets have different patterns, including orthogonal random, oriented, and hexagonal (French, 1996). Typical of growing ice-wedge polygonal systems (rampart polygons) is a raised rampart on either side of the fissure with a height of 0.3-0.8 m. Typical young growing polygons with ramparts are characteristic of the river floodplains in the Taymyr peninsula. The destruction of polygonal thick ice wedges by melting and thermoerosion leads to the formation of alases (thermokarst lowlands and lakes) and baydjarakhs (thermokarst mounds also known as graveyard mounds), which occur in northern and central Sakha-Yakutia. In the stage of degradation, polygons develop convexities with deep thawing furrows (dome-like mounds in appearance). Domed polygons with soil wedges inside the furrows is typical of Bolshezemelskaya Tundra (Konishchev and Tumel, 1989). Several cryogenic processes control their formation: thermal contraction, which forms polygons with ice wedges; thawing and thermokarst; solifluction and nivation, which transforms polygons into mounds and ice wedges to soil wedges. The relief-forming processes are accompanied by cryogenic weathering which transforms coarse and fine-grained deposits into cryogenic clay eluvium ('cover' clay), a phenomenon known as 'polar cover complex' (Popov, 1962a). Frost heave results from water migration to the level of freezing and its subsequent segregation into ice layers and lenses (Popov, 1967; Kudryavtsev et al., 1978a; French, 1996). This occurs wherever moisture is present and sediments or soils are frost-susceptible. Localized and intense frost heave forms small (0.5 m-1.5 m) seasonal mounds and large (3-8 m) perennial mounds. The more widespread and typical annual ground displacements are of 5-20 cm. These hamper construction and maintenance of roads, buildings, and pipelines in permafrost environments. Other forms of frost mounds, for example, bulgannyakhs (pingos) and hydrolaccoliths, are described above. Note, that bulgannyakhs, which form on lake bottoms, are exposed to the new perennial freezing in alases, drained lakes, and in the deltas of large rivers of Eastern Siberia. These mound shapes are attributed to cryostatic (i.e., freezeback) pressures generated in taliks under lake bottoms and this is why they are typical of northern and central Sakha-Yakutia, where lakes occupy above 50 per cent of the entire area. Thermokarst (a term first introduced by M. Ermolaev in 1932) is a process of ground ice melting accompanied by subsidence of the ground surface (Brown and Kupsch, 1974; Kudryavtsev et al., 1978a; French, 1996). Thermokarst is among the most important processes shaping permafrost landscapes. It develops in response to the disruption of the thermal equilibrium of permafrost and is controlled by such changes in the environment as climatic warming, increase in snow cover, and an increase in seasonal variation of temperature, deforestation or destruction of vegetation (e.g., due to forest fires), presence of standing water, and anthropogenic impacts (Popov, 1967; French, 1996). Thermokarst is typical of most permafrost regions in Russia, being particularly active on plains and in river valleys. The most clearly defined forms of thermokarst develop in areas of high ground ice content, especially where ice-wedge polygons are well developed. The occurrence of thermokarst on a large scale reflects a long-term climatic amelioration dating back to the Holocene climatic optimum (Kachurin, 1962; French, 1996). Contemporary thermokarst is linked with geographical zonation and ice content of permafrost (Kachurin, 1962). This relationship is not straightforward: as air and ground temperatures decrease northwards, the occurrence of thermokarst diminishes; however, the increase in ice content enhances potential for thermokarst development. Thus, the main controls over thermokarst development in the southern taiga and forest-steppes of Eastern Siberia and the Far East are relatively warm and long (4-5 months) summers, the depth of active layer (2-4 m), and the high annual ground temperature (between 0°C and -1°C). Thawing of frozen ground, whose ice content is low, produces small and shallow thermokarst forms (although relict thermokarst here has larger dimensions). The causes which can block the development of contemporary thermokarst include low annual ground temperatures (below -1°C) and thick vegetation cover, which shields the underlying permafrost from solar heat. Contemporary thermokarst occurs in the arctic tundra in northern Western Siberia, Sakha-Yakutia, and the Taymyr peninsula where it is related to the abundance of lakes. However, due to the extremely low air and ground temperatures and low precipitation which prevent thawing, present-day thermokarst is relatively rare and relict forms prevail. Thermokarst is more widespread in central Sakha-Yakutia where the unique environment strongly favours its development. Here, thermokarst is represented by alases and baydjarakhs, which form different stages of polygonal relief degradation and constitute the most outstanding phenomenon of permafrost in Russia. In central Sakha-Yakutia, deep thawing of frozen ground, which has a high ice content, is caused by the very warm summers: mean summer air temperatures are around 18°C and maximum temperature in July reaches 38°C (Regional Cryolithology, 1989). The segregated ice layers in frozen deposits often account for 50-80 per cent of the total volume of deposits and thick (20-60 m) ice wedges may occupy between 30 per cent and 60 per cent of the surface (Czudek and Demek, 1970; Soloviev, 1973). The first stage of thermokarst development is thawing of ice wedges, which creates deep thaw depressions. As soon as these depressions reach 1-1.5 m in depth, vegetation cover is destroyed, slumping begins, and the polygon cores form baydjarakhs. These are silty or peaty conical mounds between 3 m and 8 m high, which inherit the dimensions of the polygons from which they have developed. Young baydjarakhs have the form of flat topped cones, whereas the tops of old baydjarakhs are more convex. Through the continued degradation of baydjarakhs, alases develop. An alas has a circular or oval shape with steep sides and a flat floor often containing a thermokarst lake. Its area often reaches 25 km2. Taliks form under the young alases. With time, alas lakes either get filled with deposits or drain to a lower alas or a stream. The talik freezes and ice wedges and bulgannyakhs begin to develop. The lowlands of Siberia have been altered considerably by alases and thermokarst lakes. In north-eastern Siberia 60-80 per cent and in central Sakha-Yakutia 40-50 per cent of the initial land surface has been destroyed by alases (Czudek and Demek, 1970; Regional Cryolithology, 1989). Thermokarst lakes occupy up to 70 per cent of the terrain in Western Siberia (Regional Cryolithology, 1989). These processes combine both the thermal and fluvial erosive capacities of running water and waves (Are, 1980; French, 1996) and result in lateral permafrost degradation due to cliff and bluff retreat, lateral river thermal erosion, and marine or lacustrine thermal abrasion. Ground ice slumps and thermo-erosional niches are some of the most distinctive features developing this way. Niches, which are between 2 m and 20 m deep, form in the ice-rich silt and clay at the flood-water level along river banks and coastal bluffs following high tides and storms, because the water temperature is higher than the temperature of frozen soils. These processes are particularly typical of the Arctic islands and coastal plains of the Laptev and East Siberian Seas. The formation of niches can lead to the collapse of the overlying frozen sediments along the boundaries of ice wedges or massive ice which run parallel to the shoreline. Thus, in 1961 the coastline retreated by 15 m within two days in Moastakch island in the Laptev Sea (Are, 1980). Thermal erosion destroyed Vasilyevky and Semenovsky islands in the Laptev Sea (Czudek and Demek, 1970) with the rate of coastal retreat at Semenovsky island being as high as 55 m a-1 (Are, 1980). Along the Barents Sea coast, the average retreat rates are between 0.5 m a-1 and 2.5 m a-1; the maximum rates reach 12 m a-1. The retreat rates of the Laptev Sea coast are higher and range between 2 m a-1 and 4 m a-1, with a maximum rate of 55 m a-1 (Are, 1980). Solifluction is regarded as one of the most widespread processes of soil movement in periglacial areas. Thawing of the active layer leads to the formation of water-saturated soils and the presence of permafrost creates an impermeable layer that helps to maintain water saturation near the surface. Although Solifluction deposits are found practically on any slope, the occurrence of Solifluction relief is more limited. The following conditions favour the development of Solifluction: a slope angle of 8-12°, (although it is often observed within a much wider range of 2-25°); the presence of fine-grained soils, deposits, and ground, transformed by cryogenic weathering; and availability of water-saturated thawing soils (Kudryavtsev et al., 1978a). The major influence upon solifluction is vegetation. Vegetation stabilizes slopes, improves soil structure, and intercepts precipitation, and for these reasons solifluction is most widespread where vegetation is sparse (i.e., in tundra). The debris-mantled hillslopes of solifluction origin are ubiquitous on the western plains of the permafrost zone. Here, solifluction relief is presented by stripes, tongues, terraces, and garlands. Solifluction in mountains is characteristic of the lowest belt of the Arctic and subarctic mountains. The typical solifluction regions are the Chukchi and Taymyr peninsulas where alternating stripes of fine-grained and coarse stony deposits (sorted solifluction) are found (Regional Cryolithology, 1989). Another type is the block field or block streams (also termed kurum), formed by frost weathering of exposed rocks. These are typical of the nival and tundra mountainous belts of Transbaikalia and the Central Siberian plateau (Geocryology of the USSR: Southern Mountains of the USSR, 1989). Patterned grounds is the most common cryogenic form of microrelief. This is a general term used to describe ordered and symmetrical microphysiographic patterns (Brown and Kupsch, 1974). Different varieties of patterned ground such as spot-medallions, polygonal and hummocky forms, stone circles and rings occur in the tundra environment (Plate 6.3). Sorted and unsorted patterned ground can form nets of circles on flat surfaces and steps or stripes on hillslopes. They are created by different processes in the active layer: frost cracking, contraction, heave resulting from cryostatic pressure and ice segregation in winter; ice-melting and dilation subsidence in summer; and frost sorting around the year. The origins of patterned ground are still under discussion and Corte (1966), Washburn (1973, 1979), Jahn (1975), Pissart (1987), and French (1996) provide detailed reviews of various hypotheses. 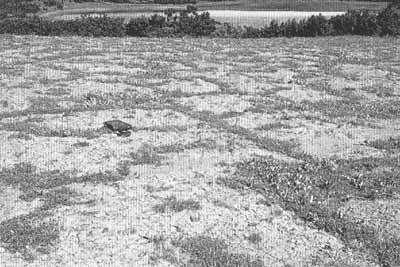 Patterned ground most often has the following morphology: spot-medallions which may be surrounded tussocks, flat, curved or convex heaves (which have a size range between 0.5 m and 2.0 m) and hummocks. They are typical of mineral and peaty soils of relatively well-drained tundra terrains and are widespread on the accumulative plains of northern Europe, Western Siberia, and the Taymyr peninsula. Sorted patterned ground (circles, garlands, nets, and polygons) is found on ground rich in coarse-grained material which is located close to the surface. It is typical of the Arctic islands, flat summits, and pediment-like forms of tundra plateaux and nival mountainous belts (Popov, 1967).